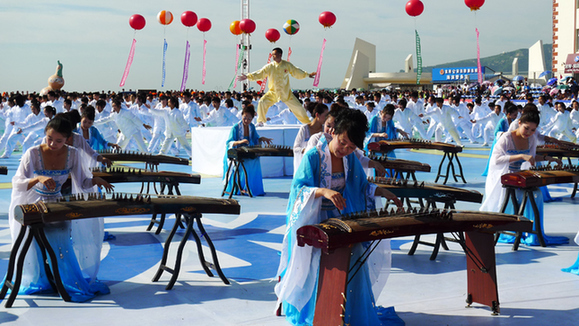 A mass Taiji (Tai Chi) performance was held on stage amidst music of Chinese zithers at Longwan beach, Huludao city, on Wednesday. The showing was one of the main events held during the first China (Xingcheng, Huludao) International Swimsuit Festival from August 16-17. More than 1,000 amateurs, including students, soldiers and other enthusiasts attended the performance of "Chinese Taiji Exercise." Among them, the oldest performer was 79 years old, and the youngest only 4. The performance, called the "Nine-step Taiji Exercise," was designed for Taiji beginners and mixed the signature body motions of five Taiji schools. Since it was created two years ago by Chen Zhigang, president of Huludao Taiji Association, it has been popularized in 320 schools in Huludao, home to a total of more than 400,000 students. The number of practitioners of the new Taiji art is expected to reach one million – over one third of the city’s population – including the students' parents, government officers, urban residents and army soldiers. It is project to become a popular physical exercise among the public in the city starting from September this year. 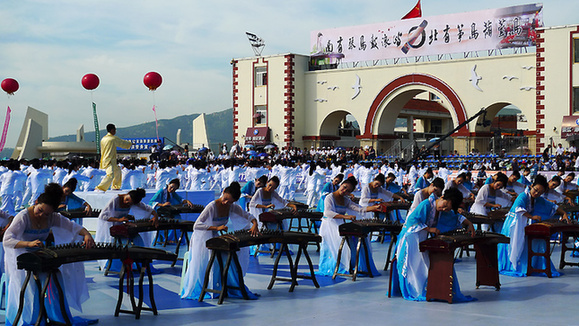 At the front of the Taiji performance, 50 women in blue from the Chinese Zithers Island art troupe provided music from Chinese zithers. The tune, called "Taiji Charm," was composed by China's zither master Wang Tianyi specifically for this event. It was the first time in the country where Taiji and Chinese zithers music – both traditional Chinese arts – were performed together on stage. Other events of the festival included a swimsuit model contest, a swimsuit design contest, a bikini show, a conference on investment and trade, and a beach volleyball game.